Social practice is an art medium that focuses on social engagement, inviting collaboration with individuals, communities, and institutions in the creation of participatory art. For artist Kenneth Tin-Kin Hung, social practice meant taking on the very foundation of capitalist society – money. Inspired by complementary currencies like Bangla-Pesa, alternative currencies like BerkShares and decentralized monetary system like BitCoin, Make It Rain (∄MIR) consists of a limited circulation of 100,000 custom designed and printed currency called ∄MIR, short for “Make It Rain”- the action of throwing stacks of money up in the air. The choice of the name ∄MIR also stems from the Russian word “Мир” meaning “World”, “Peace” and “Society”. The ∄MIR currency is strapped in 50 counts with a total quantity of 2,000 bundles available for purchase. The general public are provided an “investment opportunity” to trade U.S. dollars in exchange for this new currency. The initial exchange rate is $1 USD to ∄1 MIR. Because of the opacity of the ∄MIR currency system, the more the ∄MIR currency is sold, the more its values increases. Similar to the decentralized digital currency Bitcoin, ∄MIR will not devalue due to a set limit in circulation. Patrons can check the latest exchange rate online. Make It Rain (∄MIR) investigates the relationship between capitalism and our fiduciary monetary system. In 1971 during the Nixon Shock, the United States unilaterally terminated the convertibility of the US dollar to gold and rendered the US dollar a Fiat Money. The money we used nowadays is not convertible into gold, silver or any other commodity and has no intrinsic value. It is backed only by faith that it is an accepted medium of exchange. By creating a currency that combines both Fiat Money (in this case the faith to the artist’s career) and Commodity Money (artist’s work as valuable commodity), the project examines the possibilities of the democratization of money by playing with the three functions of money- as the medium of exchange, the unit of account and the store of value. Wait, that’s not all. The project aims to ask questions about our monetary system while alleviating poverty through microcredit lending. 25% of each ∄MIR sold will be used as sustainable loans to help entrepreneurs in developing world through the non-profit Kiva.org. Hung believes “ART should not be a mere decoration” on the walls of the rich, but rather should contribute to positive change. “We have an obligation to help people think,” he says. And hey, if you think about it, there’s almost nothing as absurd as money. Speaking of change, Hung also showcased a series of digital prints on canvas called “In G.O.D. We Trust, where ‘G.O.D.’ is an abbreviation of “Global Obama Devotion.” When Obama was elected President, Hung saw this giant surge of faith around the world. But how was Obama going to succeed in tackling the world’s problems from Day 1? The result was a series of works depicting the hopes, fears, and expectations of the global community. 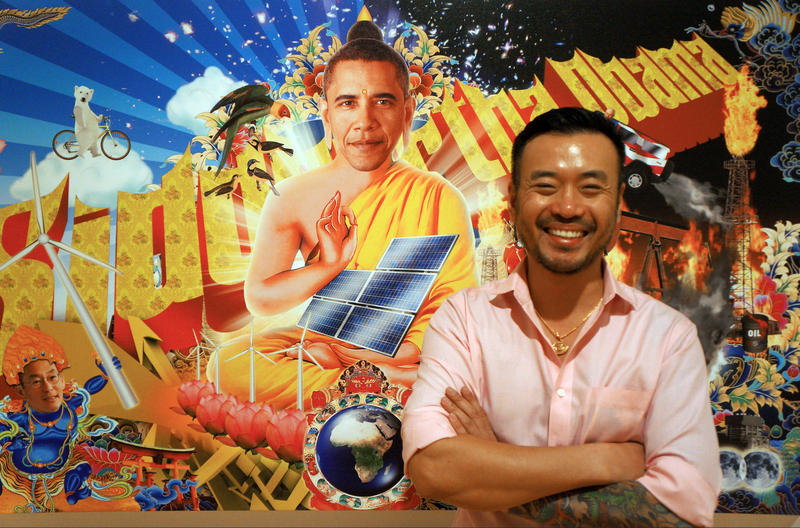 It’s another spiritual journey: Obama as Siddhartha Gautama dealing with global warming and renewable energy. The scene is loosely based on Shakyamuni’s first sermon at Deer Park, Northern India. Obama is holding a solar panel in his hand, set in motion the Wheel of Life (Bhavacakra) with an Earth inside it. Obama as Our Lady of Guadalupe dealing with Mexico/US border issues including drug trafficking violence and illegal immigrant policy. He is holding a green bong that assembles the appearance of a gun. Behind him are Minuteman Project fundraising coins and fictitious North American Currency Union Amero coins. Next to him is a Day of the Dead skull musician standing on a huge Marijuana bud on top of $207 Millions cash seized from Zhenli Ye Gon’s house in Mexico City. 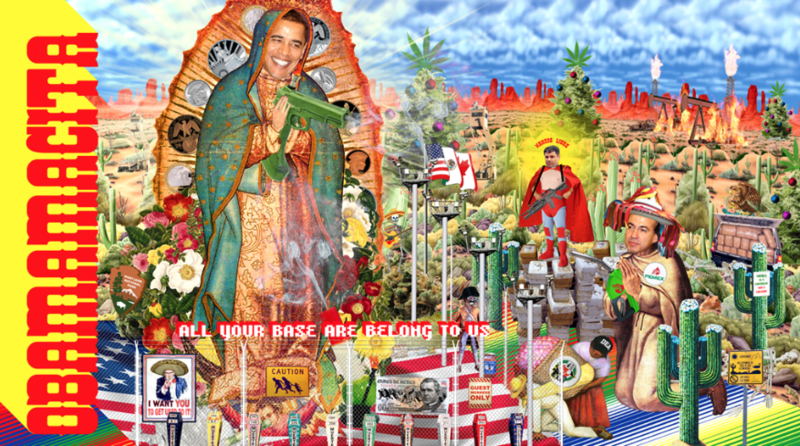 Obama is standing on an American flag, protected by fences, border patrol camera towers, a “Mary Jane” National Park logo and a Minuteman with a Day of the Dead Sugar Skull mask. In front of the fence erects the Tijuana San Diego border death monument, a protest against Operation Guardian that caused over 3,000 Mexicans death. An image appropriated from Diego Rivera’s mural depicts an immigrant having an Immigrant Solidarity Network logo on his basket, while entering the US zone, being searched by a DEA agent. In the Mexico side, Felipe Calderón disguised as Juan Diego wearing a Zapatista hat. Although he is kneeling down, he is holding a gas nozzle pointing towards Obama and wearing a logo of PEMEX. Behind him the leader of Sinaloa Cartel Joaquin “El Chapo” Guzmán dressed as “Narcos Libre” holding a M4-Carbine, standing on top of a huge pile of cocaine packages. Whew. How does this flight of the imagination compare with the actual tasks of the everyday Obama? The work never ends. Kenneth Tin-Kin Hung was born in Hong Kong and is now living and working in New York. He earned his B.A. in Arts degree from San Francisco State University. His work has been exhibited at the New Museum, New York; Yerba Buena Center Of The Arts, San Francisco; Berkeley Art Museum, Berkeley; Sundance Film Festival, Utah; Postmasters Gallery, New York; Cartwright Hall Art Gallery, Bradford, United Kingdom; Urbis, Manchester, United Kingdom; Hebbel Am Ufer theatre, Berlin, Germany and ARoS Aarhus Kunstmuseum, Denmark. This article is part of a series based on Corpocracy, a group show now at the Station Museum, Houston, Texas.